MULDROW (KFSM) - Terry Jones has helped turn the Muldrow program around in his three seasons as head coach but his biggest challenge will come this fall. 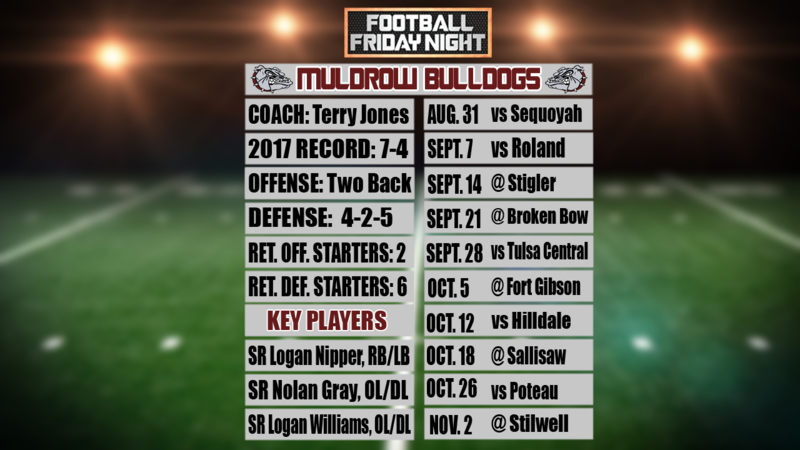 The Bulldogs have to replace 17 seniors with starting experience, including nine on the offensive side of the ball, plus Muldrow moves back up to 4A and the always tough 4A-4. "You know, we got our work cut out for us," Jones said. "This 4A conference, you look at it from top to bottom, it's a tough conference. We lost 17 kids who were starters and been around here for three years so we got a lot of young kids and a lot of spots to fill but so far I've been happy with the kids' progress." Muldrow moves back into a district with the likes of Poteau and Sallisaw after spending the past few seasons in class 3A. "I think we have a lot of improving to do from this last year to this year," Muldrow senior Logan Nipper said. "Tougher schedule of course but I think we'll be able to pull through." One strong point for the Bulldogs will be their defensive front as they return their entire defensive line plus both inside linebackers in the 4-2-5 scheme. A young secondary will line up behind that front six so applying pressure will be key. "We've got a lot of people stepping up," Muldrow senior Logan Williams said. "Just having to work hard. Just having to work hard for our positions, learn new plays, learn stuff from scratch really." Muldrow kicks off the season on Aug. 31 as they host Tahlequah Sequoyah.